The Ashland County Family & Children First Council is a network of local service agencies, government, advocates, parents and funders of services for children and families. The FCFC holds as its purpose to improve understanding and knowledge of county-based services. It serves to identify service gaps and improve delivery for families seeking assistance with their children. We have representatives from twenty-six different county entities and over sixty members and partners on various committees and activities. We start with the family. Families are the center of our work and are active participants in the service planning, and decision-making process. Our ultimate goal is to enable families to function independently of the system and increase their ability to be self-sufficient. We take a personalized approach in building a unique service opportunity plan based on a foundation of the individual family’s strengths. This plan is also centered around respect for the cultural, racial and ethnic differences of the families we serve. Our work is results-oriented. We employ ongoing evaluation of outcomes to ensure effectiveness. 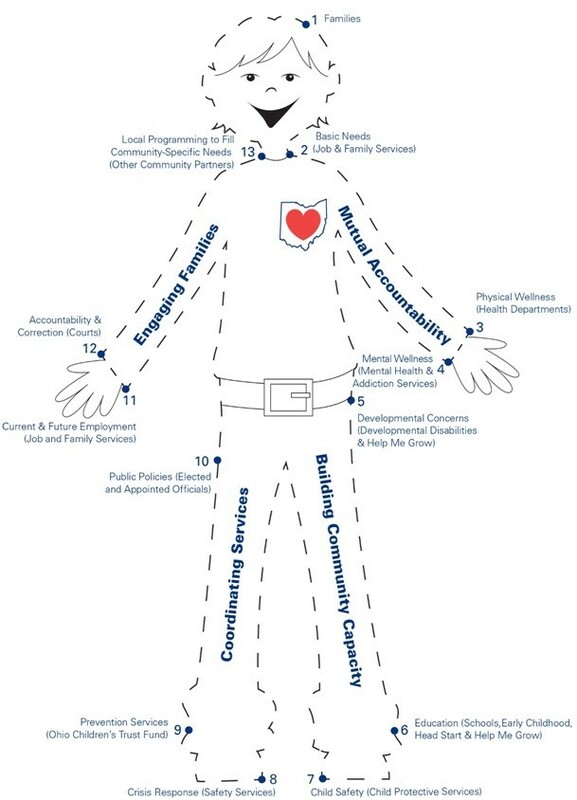 We believe that effective coordination of services for our families includes delivery of high quality services; reducing and eliminating duplicative efforts among agencies and barriers to collaboration; integration of community and family supports; and full utilization of funding resources. Ashland County Family & Children First Council connects the dots to eliminate redundancy and bring resources together for planning, monitoring and improving outcomes for families and children.